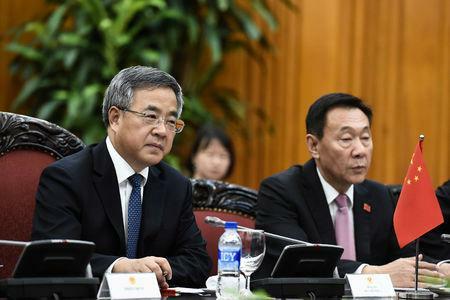 HANOI (Reuters) - Chinese Vice Premier Hu Chunhua on Wednesday called for a rejection of protectionism and said unilateral trade policies by some countries posed a "most serious hazard" to the world economy. His comments come at a time of a worsening trade dispute between China and the United States, which has been pursuing measures widely regarded as protectionist under President Donald Trump. Last week, Trump said he was ready to levy additional taxes on practically all Chinese imports, threatening duties on $267 billion of goods over and above planned tariffs on $200 billion of Chinese products. China on Monday said it will respond if the United States takes any new steps on trade. He has criticised China's record trade surplus with the United States, and has demanded that Beijing cut it immediately. If the United States imposes additional tariffs of 25 percent on $200 billion of Chinese goods, unemployment in China could increase by 3 million assuming Beijing does not take any counter measures, JP Morgan analysts wrote in a note. If Washington moves ahead with 25 percent tariffs on all Chinese imports, about 6 million jobs in China could be affected, assuming no counter steps by China and no change in the value of the Chinese yuan, according to JP Morgan.